[Source RC44] With four wins and one defeat, Team Banco Espirito Santo, BMW ORACLE Racing and Ceeref lead the match racing event of the Cagliari RC 44 Cup. With up to 25 knots of wind under a great sunshine, the day was simply superb! Cagliari, April 23, 2008 – Whoever thinks that match racing should be competed on board slow boats should come to Cagliari and watch the ten RC 44’s match-racing in 25 knots of wind, surfing down the waves and yet crossing the arrival line merely separated by a handful of seconds. This is indeed what happened throughout the day in Cagliari on day one of the RC 44 Cup. The ten boats – and their (mainly) pro skippers – offered an extraordinary show off the coast of Cagliari, sailing no less than 21 matches in the best possible conditions. 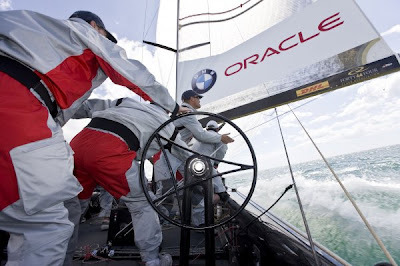 Leader of the event after day one, Larry Ellison and his crew onboard BMW ORACLE Racing impressed a lot of people by the quality of their performance in those difficult conditions. They started the day with a win against Cameron Appleton’s Team Aqua, crossing the arrival line eight seconds before their opponent after a very intense match. Even closer, the match between James Spithill’s Team Ceeref and Ben Ainslie, onboard Team Banco Espirito Santo and won by Spithill by 3 seconds! But the closest of all matches took place in the next flight, in a dual between Cro-A-Sail (Morten Henriksen) and BMW ORACLE Racing: one second between the two boats on the finish line and a joyfully celebration for the Croatians. At the end of the day, three teams share the same number of points in the leader board of the match race event: Team Banco Espirito Santo, BMW ORACLE Racing and Ceeref. However, Larry Ellison’s team is the provisional leader thanks to victories against its direct opponents. A great achievement for the only non-professional helmsman involved today. Five flights are yet to be sailed and the game remains open. Indeed, Team Aqua (Cameron Appleton) and Cro-A-Sail have both won three matches and are still well in the game. Ben Ainslie, Team Banco Espirito Santo: “It was fairly hard for me to adapt to this boat, particularly during the pre-start. Luckily, the team helped me a lot. They are great, and this is definitely a day when the team counts for as much – if not more - as the helmsman. But what a day! It was awesome, and certainly one of the best sailing days I have had for a long time. 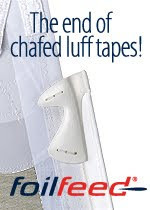 James Spithill, Team Ceeref: “This is simply the best level you can get in match racing, worldwide. You have match race world champions, America’s Cup skippers, world champions of several classes. It’s just very tough. The boats are great, and very fast. Thanks to their speed, there are always great passing opportunities. It’s very exciting. Morten Henriksen, Cro-A-Sail: "The highlight of our day is obviously the victory against BMW ORACLE Racing. It was so close we didn't even know who had won. Other than that, we have been a bit lucky as we got two points against competitors who suffered gear failures. But we are happy to be well in the game." Jes Gram Hansen, Mascalzone Latino: "It's the first time I sail back with Mascalzone Latino since the Cup, so I am really happy although our results weren't good today. For us, it's a new boat, a new team and It was very windy so we suffered. But we had a great time."